Agrison offers a 35 HP tractor with front end loader and slasher package to help prepare rural property owners for the summer and potential firestorms. According to Australian fire authorities, both urban and country regions are approaching a seriously dry fire season, requiring everyone to plan ahead. Australia has just experienced its warmest 12 months since climate records began. The winter of 2013 has been the hottest winter on record. The Bureau of Meteorology claims that so far in 2013, Australians have already experienced the hottest day, month and season. Rural and lifestyle properties and remote areas are particularly at risk of bushfires. Agrison recommends that property owners regularly slash their paddocks, clear up the mess around their property, and ensure the availability of a suitable diesel generator for back-up power supply. Every property at risk of bushfires should be equipped with a water pump connected to a suitable diesel generator since it is likely main power will be cut off in the event of a fire. Agrison’s 35 horsepower tractor with front end loader and slasher package is now on offer to help prepare for the fire season. 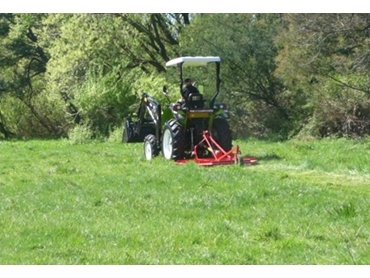 The front end loader is equipped with a 4-in-1 bucket ideal for clearing the mess on the property, and a free 4’ slasher to keep grass levels to a minimum height. The Agrison diesel generator range is 100% compatible with biodiesel and is available in sizes ranging from 15kVA to 1000kVa. Agrison Generators Sales Manager Nick Yokus says fuel consumption depending on the load can be as little as 1.6 litres per hour, making the 15kVA diesel generator excellent value for money. Nick observes an increase in rural communities purchasing Agrison tractors and generators in preparation for the hot summer ahead. A leading supplier of agricultural tractors, implements and diesel generators in Australia, Agrison caters to a wide segment of users from the lifestyle property owner through to the dairy farmer. Agrison utilises a spare parts inventory in excess of 10,000 items, ensuring prompt after sales service and customer satisfaction.